Nothing like a last minute holiday. Mini Basu tucked into one arm, oversized summer tote draped on the other it was time to terrorise other passengers on a long haul Kolkata flight. It was all going so well. Until we returned via Dubai. I arrived at the departure gate. Baby intact. Outfit in place. Handbag missing. Disaster. All those valuables. That lucky lipgloss! The irreplaceable Chanel sunglasses! A brand new, albeit empty, Coccinelle wallet! Luckily, the man had the passports and boarding cards. We jumped on the flight back to London. Mini Basu played merrily with the crew. While I mourned the loss of my precious belongings. I wasted no time on my return. I ranted and raved at Dubai airport police. Someone stole my handbag. The sunglasses were like no other. The bag was almost new. And when I stopped for breath, they announced it had been found in the last coffee shop I had visited. All contents intact. This called for celebration. 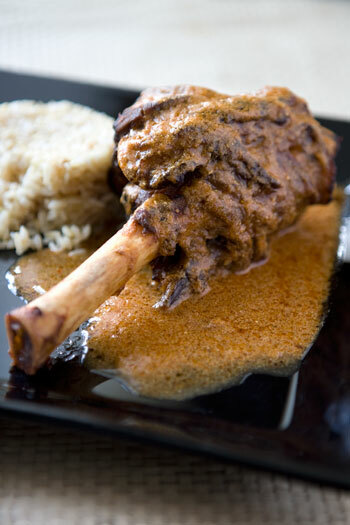 I remembered seeing a decadent recipe for Nalli Gosht, or lamb shank curry, in an old copy of Indian GQ. Contributed by a hotel chef it had the prerequisite cream, butter et al. In my version, an oven-baked lamb shank curry, you can shove the whole lot into the oven and finish off the curry by running it through a sieve. I ditched the cream, but a small amount of butter really crowned this beauty. At just over an hour, it's on my uppermost limit of quick Indian cooking. But I defended my choice by having ample time to make Jeera Pulao, Kulfi and raita for my small dinner party while the lamb did its thing in the oven. You could, of course, cook this on the hob but the shanks will take at least an hour and a half to soften, while you turn them at regular intervals. Slice the onions and chop the ginger and garlic up finely. Turn the oven on to 190 degree centigrade (170 for fan assisted). Place a casserole dish large enough to hold the two lamb shanks on the hob and bring the oil to heat. When piping hot, throw in the bay leaves, cinnamon and cardamom. As they sizzle up, mix in the onion, ginger and garlic and fry for 10 minutes until translucent. Then add all the masala powders, along with the lamb shanks. Vigorously stir them, mixing well with the masalas, until the shanks brown and the pungent aroma of the spices subsides. Now, pour in the tomato sauce and transfer the casserole dish to the middle shelf of the oven. If you have bought a pack of lamb shanks, it should tell you how long they will need to cook. If not, roast for an hour flipping the shanks over once half way through cooking time. When the lamb falls off the bone easily when prodded with a fork, remove the casserole dish from the oven and turn it off. Carefully remove the lamb shanks on to a oven safe plate and stick them back in the oven to keep them warm. 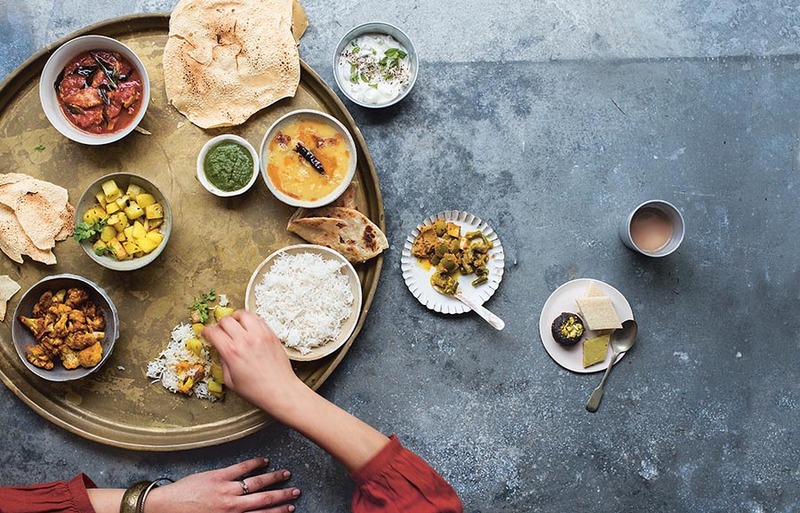 Then pass the curry in the casserole dish through a sieve, pressing hard with a wooden spoon to get as much of the ingredients, into a small pan. Cook the curry on a low setting, mixing the yogurt and butter in for about ten minutes until you see oil floating to the top through little pores. Add salt to taste, stir in the garam masala and served spooned over the tender lamb shanks with some Jeera Pulao on the side. Check out Deeba at Passionate About Baking’s mouth watering version too. How lucky you are that your belongings were recovered! 🙂 Yummy dish, too, Mallika! Can’t go wrong with lamb shanks! You were in Kolkata Namesake ? I wish we could have met – next time then ? Youre lucky your bag was recovered ..
Oh, I’m so glad you found it! You deserved a celebration and, honestly, I can think of no better treat than your divine-sounding curry! hey i almost gave up cooking.. sooo happy to have u back 😀 and as i head home (kol) for puja, will try this out.